The Team recently popped along to the Miller Harris Boutique in Belgravia, to see their beautiful new “Symphony of Colour” summer collaboration with Cyril Destrade. 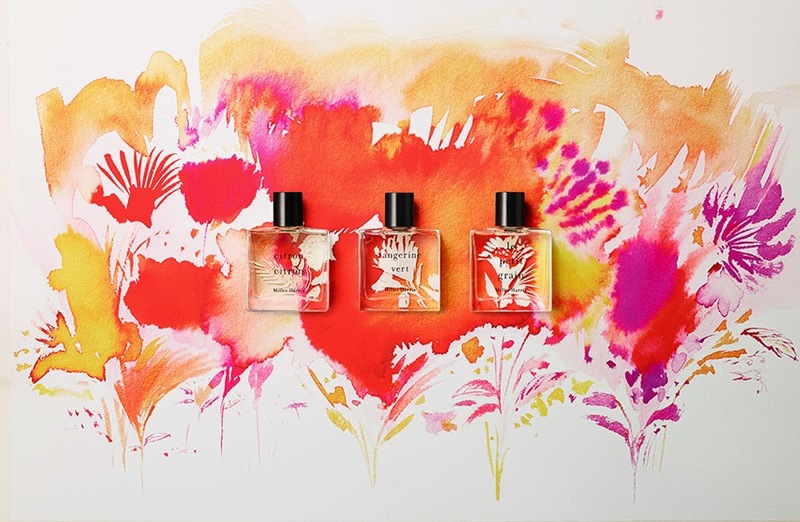 A re-release of three of their well-known citrus-based fragrances, with new limited edition water-coloured packaging, here’s the team’s thoughts on the fragrances themselves. Some of you may have noticed I have an unusual name. It’s Sicilian, and those who know me best, know I never stop blathering on about this. Sorry and all that, but being an inbetweenie Anglo-Italian affects EVERYTHING. Look at me with my lapsed Catholic rusty bi-lingualism! No I’m not called Tandoori or Tindra, that’s an IKEA flooring. Yes, my dad was a chef and my mum is a seamstress. What of it? … I’m meant to be talking about perfume aren’t I? It all links up, honest. I spent every summer as a child in the Sicilian countryside on the north-eastern coast near the city of Messina with the Aeolian islands in view. My grandparents had fig, bergamot, lemon and orange trees, trails of verbena led to the olive groves that were punctuated by prickly pear cacti. I am really lucky that this was my summer playground, and nothing takes me back to it like perfume. frequently. I think for this one it might be worth it. Bearing a strong resemblence to Hermes’ Orange Vert (one of my all time favourite scents), Miller Harris’ Tangerine Vert starts in with a startlingly photo-real blast of tangerine peel, which almost verges into an extremely clean and lively-bright grapefruit, but this is backed up with the smell of bright green crushed leaves, that eventually softens into a blend of cedar and musks. It’s bright, and pretty (and hugely unisex in appeal), and uplifts the spirits gorgeously. It’s a little spiky, and rather on the lively side, but that’s just what summer scents need, if you ask me. It won’t last longer than the average spell of British summer sunshine, but that just means you need to reapply regularly. I’ve suffered from a spell of anosmia recently, and this has been one of the few fragrances to cut through my smell-less world, so for that, I shall be eternally grateful. Citron Citron is one of the original Miller Harris fragrances, and the scent is a really gentle, woody spicy citrus. Very lemony, it has lime, and orange in there too. All the citrus basesare well and truly covered. This fragrance has the same sensation of lying in long grass in the summertime surrounded by very ripe citrustrees, and a cold glass of martini. We’ve all been there. too warm, being a little on the sweet side, and it’s not too zingy as a result, it dries down to an almost powdery scent. I like it a lot. Being a citrus scent, it really doesn’t last on my skin for very long, so was I bitterly (see what I did there?) disappointed. This was surprising to me, especially as it’s an eau de parfum formulation. However, I realised that spritzing this on my clothes instead seemed to make it’s ‘waft’ power somewhat stronger, and it has lasted longer as a result. Absolutely perfect for the current clammy weather, this will no doubt cut right through any of that beautifully. The limited edition Symphony of Scent collection is available in 50ml bottles from Miller Harris at £65 a pop. Previous Post 1000 Post Giveaway with Debenhams!